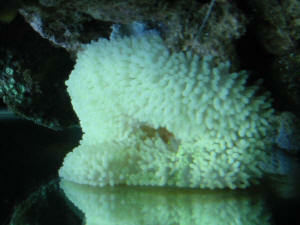 Epicystis crucifer, Flower Anemone, aquarium pic. 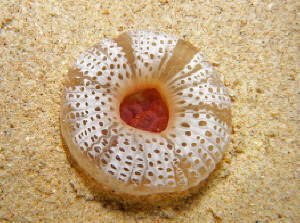 I've attached three pictures of a strange anemone. 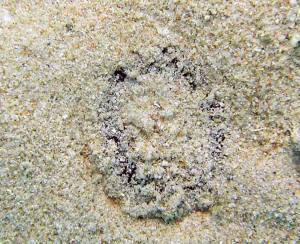 It lives in the sand at about the 10 foot depth, and is usually covered with sand during the day (see picture #1), although sometimes I can see it, especially in the late afternoon. At night it comes a little above the sand and looks like picture #2. When my dive light attracts a worm or small fish to the anemone, it closes up as in picture #3. 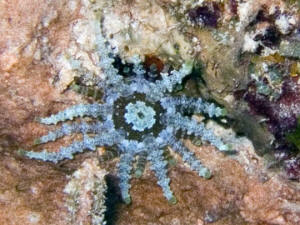 These pictures were taken on Bari Reef on Bonaire, Netherlands Antilles. It is about 1 1/4 to 1 1/2 inches in diameter. Any idea of what it is? DomRep Sea Anemone Identification 10/5/05 Hi! 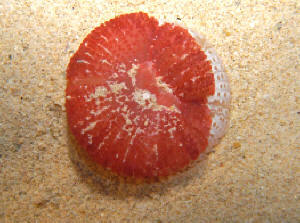 <Hello Uli> I found your website http://www.wetwebmedia.com/marine/inverts/cnidaria/anthozoa/twaanemones.htm looking for help. I need to identify an anemone. Please find jpgs attached. I could not yet find it anywhere! By the way: I was not the photographer, "it" was not touched to see a reaction, all we have is the photo shot in the Dominican Republic. Any idea? Anemone (potentially temperate) husbandry... My daughter came home from sea camp in North Carolina with a sea Anemone. It looks like a Heteractis malu, from your website. It has high sentimental value. We first tried to house it in a very small 3 gal tank, along with a few algae eaters and a mussel-that it was attached to. We were convinced to invest in a larger tank-10 gal. We did the live sand and mixed up Instant Ocean. Each time we moved it, we took whatever water it was with, and added however much we needed. We bought a heater and put it on low. The temperature quickly got "too high", 80 deg F, so we shut it off. It is now about 70 F, The Anemone does not seem to be stressed out. It is spread out and has moved location to a purchased rock. However despite the water conditioners and stress aides, the anemone seems to have contracted Ick. What do we do now, what do we feed this, do we need reef lighting? The tank is from Marineland and has a "wheel, wet dry filter on the top.